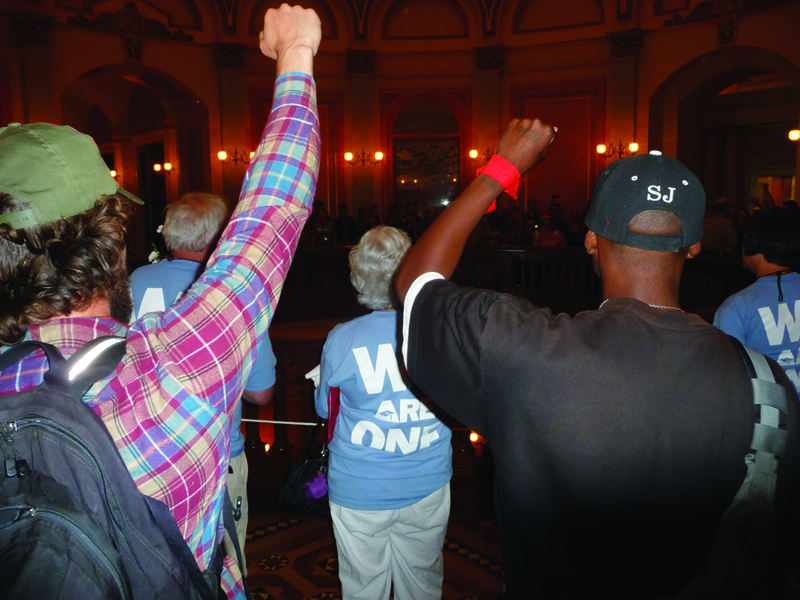 Capitol Rotunda, Sacramento, Calif. – A crowd took over the state Capitol rotunda on May 9 to kick off a week of protest against looming draconian cuts to the California education budget. Led by students and teachers noisily chanting, “Tax, tax, tax the rich! We can fix the deficit!” and “Bail out the schools, not the banks!” the demonstrators marched and danced around the rotunda for half an hour before sitting down on the marble floor for an hour-long speakout. In the end at least 65 were arrested and spent the night in jail. They chanted, “No cuts, no freeze! Education should be free!” They sang, “We shall not be moved” and “Get up, stand up! Stand up for your rights!” and invoked the history of the Civil Rights movement. People lined up to take turns speaking. When the California Highway Patrol tried to use bullhorns to disperse the gathering, people shouted, “There’s a line!” informing the CHP that they had to get in line like everyone else if they wanted to speak. As protesters were being arrested, San Francisco City College professor Rodger Scott raised the question: “Is this a public building? Are we the public?” Among those arrested were veterans of the early April occupation of the Washington state Capitol and the early May occupation of the Sacramento State University administration building — part of a wave of protest to defend public education. Arrestees spent as long as 17 hours in custody. Some had to wear plastic-strip handcuffs for as long as 10 hours. Among protesters there were several schools of thought about tactics. Top leaders of the California Teachers Association focused on backing Democratic Gov. Jerry Brown’s program of extending some regressive taxes — such as the sales tax — as a way of raising money for education. Many rank-and-file teachers and students countered with a plan to raise taxes on corporations and the rich, which Gov. Brown and most fellow Democrats have opposed. Both Republicans and Democrats propose devastating multibillion-dollar cuts to education in California, with or without any tax increase. Dave Welsh was among those arrested on May 9 at the Capitol rotunda in Sacramento. He can be reached at sub@sonic.net.